We have learnt in Section 8.1 the ratios for sin, cos and tan of angles. The equations (I), (II) and (III) are called ‘Fundamental identities’. In summary we have the following relationships between various standard trigonometric ratios. Note: All these relationships can be derived by using just sin2 +cos2 =1. 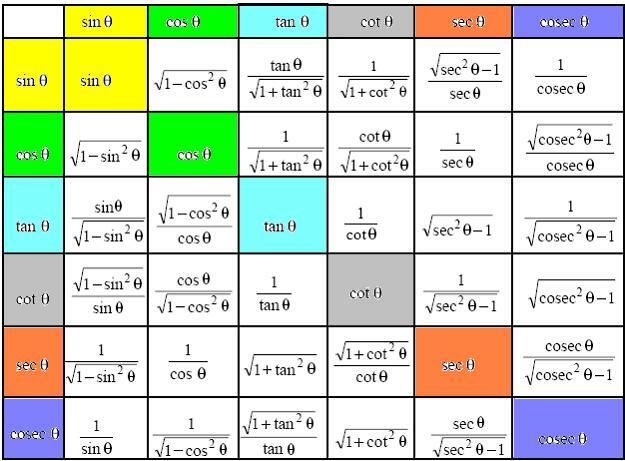 The Fundamental identities are useful for simplifying various trigonometric expressions. In a right angled triangle, if is one angle then the other angle has to be 900- (sum of all angles in a triangle is 1800). 8.4 Problem 5: If sec4A=Cosec(A-200), Where 4A is acute angle, Find the value of A.